Back in December, almost a year ago it seems, I wrote about jewelry for men. I’d just purchased and had resized a hammered sterling Ippolita ring, which functionally replaced the Tiffany Metropolis sterling ring I had worn for years. It was an elegant upgrade, more sophisticated and exotic. The last eight or so months have not seen a slowing of the demand or options for men’s jewelry; the trend seems to have staying power. Bracelets are the bulk of the business, as they most closely relate to wristwatches, classically the man’s domain. Rings and necklaces are on the fringe, but tend to challenge traditional jewelry gender roles, at least as they relate to fashion. And speaking of watches…those have become a bigger market as well. Just look at the exponential success of Shinola, a competitive watch brand made in Detroit. Like anything, however, there is a spectrum. You can buy a bracelet at the mall, from Fossil in alligator-effect leather, to rubber and black crystal at Swarovski. You can order an edgy, minimalist one online. 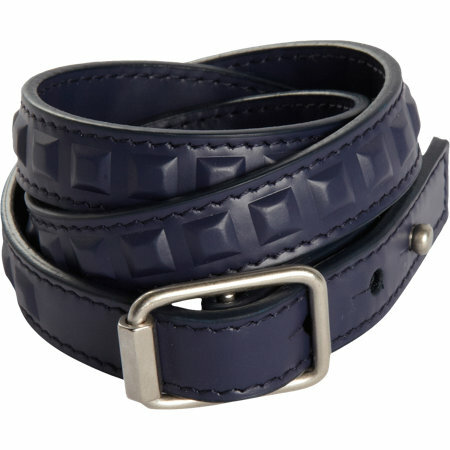 You can get one to match your Ferragamo loafers, or one that is thick and manly (see above). Or, one that is nautical, and indicates athleticism with multicolored nylon rope. 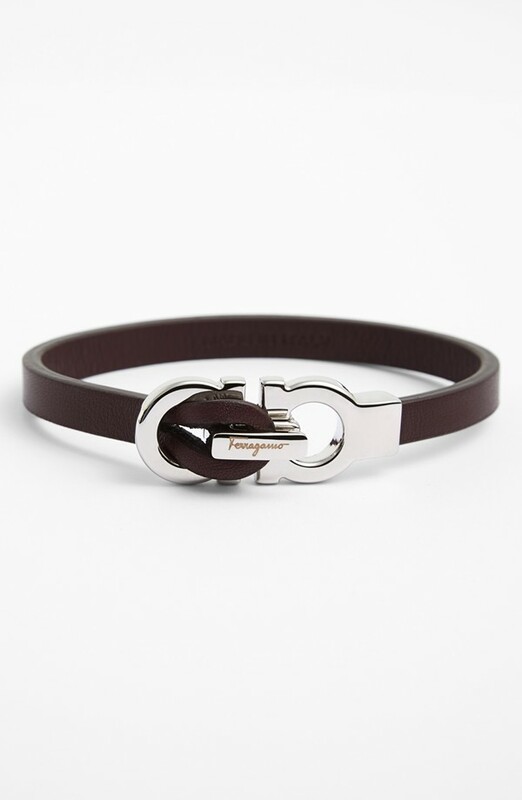 If you like the curb-chain look, a more affordable alternative to Margiela is this one from A.P.C.. Known and unknown brands alike are producing men’s wrist-wear, at every price point. You can even buy handmade mixed metal jewelry at the Gasparilla Festival of the Arts from Aaron Sault, one of the few jewelry exhibitors, of which there have always been many, that focus on men. Now, something so intimately worn should be carefully considered, and one size or style most definitely does not fit all. I feel the necessity, nonetheless, to insert my opinion. Busy, irritating-to-wear jewelry always makes the wearer look silly. Make sure it’s comfortable. Go for unique shapes, treatments, or colors, to stand out. You don’t have to wear it all the time. Visible logos or blatant free-advertising is tired. Don’t do it. It’s OK to be trendy, just make sure the piece(s) fit with your personal, timeless style too. 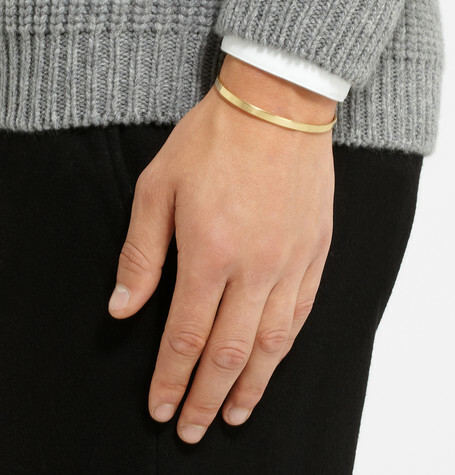 Jewelry doesn’t have to be expensive. Whatever you do, don’t stack them. Leave that passing fad to the ladies. Miansai, arguably the most visible leader of this trend, does little to stir my soul. But I can see its appeal. The themes are distinctive and directly nautical, something that speaks to sailing, which logically leads to connotations of leisure and wealth. That is, at least my guess, as to why it has become so popular. And why stores like Nordstrom and Barney’s have picked up the line. I like the mix of polished, matte, and enameled metal work, but the straps and focal materials, along with final detailing, seem vaguely raw or juvenile to me. Maybe I prefer to toe the gender boundary a little closer, hence the abundance of sterling silver on my nightstand. If you do want to check out the line, London Philips just started carrying it. Come to two weeks ago, it reappeared, this time in a matte, brushed finish, with a slight increase in price. So I had to pounce. 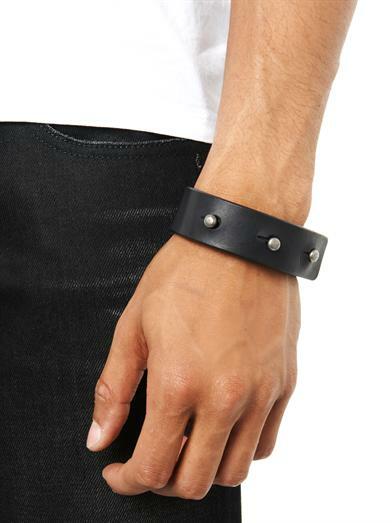 In March, in San Francisco, I indulged in a wrap bracelet with geometric studs on polished black leather, by Balenciaga from Barney’s. It’s a curt nod to punk style without actually being brash or sharp. For a well-composed outfit, I’ve found that accessories like jewelry should be added at the end, after the primary look is in place. As it turns out, I don’t dress often in a style complementary to the black leather bracelet, so I haven’t worn it as much as I anticipated. This may seem like a waste, but it just makes each time I do wear it more special. Looking back through my ShopStyle favorites list, I always return to a beaded bracelet from Gucci that, to me, mixes several themes well: Caribbean leisure, precious gems, and Gucci’s own heritage in the use of bamboo, which was substituted for leather and metal during wartime rationing in the 1940s. I’ve avoided just going for it, since it seems like a distinct style I probably couldn’t wear all the time. Clearly that hasn’t stopped me from purchasing other pieces. Jack Spade, not known for wrist wear, has a handsome leather rope bracelet in bright turquoise, that looks fresher than standard black and brown. And if none of these have been abstract enough for you, then you’re in luck. Last but not least, I’ve been eyeing this Copula Antipodal sterling silver bracelet, that is all at once slick and gnarly. Apparently it is hand made in London. Wonderful! Like I said before, there are many options. Check out my Pinterest page for more, and feel free to ask a question. Just leave a comment below. what is saks fifth avenue?